Pregnancy pelvic pain can present as back, hip, groin and/or thigh pain and is common in pregnant patients. It’s no surprise considering that the female form will undergo many changes through the three trimesters. The musculoskeletal system is challenged by changes in weight, size, shape, foetal development, ligament laxity and hormone levels. 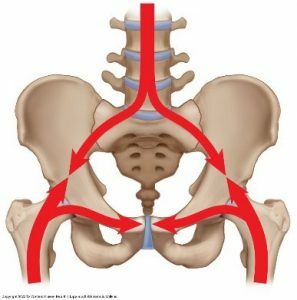 The most common pain causing tissue that we see in private practice is the Sacroiliac Joint (SIJ). It is a joint made up between the sacrum (the upside down triangle bone at the bottom of your spine) and the pelvis. The main purpose of the SIJ is to transfer mechanical force from the back and into the hips as we walk, and vice versa (think of it as a shock absorber). It also provides our nervous system with proprioceptive information. The SIJ is a stiff, rigid joint as it is designed for stability instead of mobility like your shoulder or wrist. The SIJ gets its stability from 2 different forces. Force closure: the force of muscles inserting around the joint (i.e. gluteal muscles, back muscles, abdominal muscles) compress the joint and provide stability, especially during movement. Relaxin is a hormone released in order to help prepare the body for childbirth. It increases the stretch in ligaments, especially in lower back joints, the hips and SIJs. Fluid and the weight of the foetus amount to most of this. An increase in weight will add some stress to our joints. 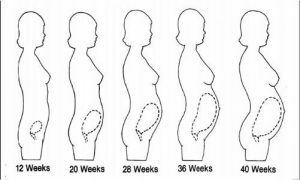 As the foetus grows the stomach does also, changing the centre of gravity and therefore the curves in the spine. The lower back will increase its arch (known as lordosis) and so too will the upper back inversely (this arch is a kyphosis). The shoulders may also round more as the breasts increase in size. If you’re planning on getting pregnant it’s a great opportunity to get fit. The stronger your body is the better your body will adapt to the changes. The lower back and SIJ will benefit greatly from stronger gluteal muscles. If you are already pregnant you can still work on the strength and activation of these muscles but the intensity should be adjusted to your individual circumstance. Here are a few exercises to get you started. It is important to remember that every person is different and that if you feel any ‘bad’ pain (that is pain that you wouldn’t expect from regular exercise induced strain) to cease and seek professional advice. Sit in a chair and place your hands on the outsides of your knees. Push your knees together with your hands, resisting the movement with your hips. Squeeze your gluteal muscles. Lie on the bed on your side. Keep your feet together and your knees slightly bent. Now raise your thighs and keep your feet together. Squeeze your gluteal muscles. Lie on the bed on your side with your affected leg on top. Keeping your upper leg straight, raise it towards the ceiling. Squeeze your gluteal muscles. Hold for three seconds and then lower your leg back to the starting position. Don’t allow your shoulders to roll forward. An easy and natural way of doing this is imagining you are a puppet with a piece of string attached to the top of your head. As the string is lifted you also rise, from the top of your head. Naturally your shoulders will fall backwards to where they should be. 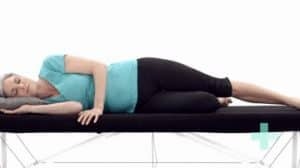 This will also switch on some important postural muscles around the spine. Extra stress may be placed upon the SIJ by poor functioning muscles and supporting joints. Your osteopath can help by mobilising the joints and decreasing the muscular strain. Treating imbalances through the hips and pelvis can help alleviate pregnancy pelvic pain.